“By having a maximum of three to five tasks a day, doing the most important task first, and working on only one task at a time with the help of the Pomodoro Technique, you will be able to finish the projects that you have been procrastinating on and achieve great things,” the creators of the Productivity Planner, Alex Ikonn and UJ Ramdas, write in the intro of the planner. In the Pomodoro Technique, you work in bursts of 25 minutes followed by a 5-minute break. The Productivity Planner suggests keeping your timer going even if you get distracted from our task at hand. At the end of the 25 minutes, take 5 minutes to stretch, drink water, use the bathroom, or to step away from your screen. Each week of the planner starts with a Weekly Planning page, where you list your tasks for the week in order of priority. At the bottom, there’s a space for you to write down your commitment for the week. Then it moves on to the daily pages, which have a motivational quote at the top and room to list 5 tasks, in priority order. Next to each task is a box, 5 circles and another box. In the first box, you are meant to write down how many 25-minute work sessions you predict the task will take. As each session passes, you colour in one circle. In the last box, you write down how many 25-minute work bursts it actually took to complete the task. Following the task list is a section for notes and at the very bottom there is a space to score your day’s productivity level out of 10. At the end of each 5-day week, there’s a page for weekly notes followed by a weekly review. In the review, you write down what your wins for the week were, which tasks were not completed, what you’ve learned and what you’ll do next week to protect your productivity. After trying the Productivity Planner on-and-off for the last few months, I finally have some thoughts to share. 1. I make my master weekly task list in my notebook. The Productivity Planner only has space for 15 tasks, which doesn’t always work for me. Plus, I prefer to be able to look at both my daily and weekly lists simultaneously. 2. I fill out my daily task list. I use the note section to jot down tasks that don’t fit in my 5 allotted spaces. 3. I don’t always start with the “most important” task. Some days, it’s hard to actually prioritize just one task that takes precedence because that’s just simply not always the case. And other times, I just don’t feel like working on that task right away. 4. I only use the Pomodoro Technique for on-going projects. If I’m “in the zone” writing a blog post, I don’t want to interrupt my flow by taking a break. It’s not always easy to get back into the flow again, so the Pomodoro Technique isn’t effective for those tasks. When I am using the Pomodoro Technique, it’s because I’m working on an on-going project and want to ensure I work on it for X amount of time that day. Even then, I often get into the flow and just stop timing myself, but it gives me a great goal for the day. 5. I’ve never filled in the Weekly Review. I might be more inclined to use it if it were just to celebrate my wins or track goals, but since it also notes what I didn’t get done, I’m not a fan. I don’t want to end my workweek concentrating on what I didn’t achieve. It comes with a how-to guide. The Productivity Planner’s first 40ish pages provide you with a detailed background and guide to using the planner effectively. It gives you background information on the ideology behind the planner, and some tips to make the most out of it. Included in this is helping you prioritize tasks, and a quick user guide for using the Pomodoro Technique. Each week has a master task list. At the beginning of each week, whether I am using a planner or a plain-old notebook, I write down a master list of all the tasks I need to complete for the week. I appreciate that the Productivity Planner included this, as most others don’t have a spot for a master task list and many tasks end up getting lost in the shuffle. The motivational quotes are great. Almost every page of the Productivity Planner as an inspiring quote that I actually quite like. Usually, I find this sort of thing a bit cheesy and unhelpful. But this time around, I appreciate the extra motivation boost. Plan your day by priority. While you don’t need the Productivity Planner to prioritize your tasks, they just make it so easy! It’s a great method to use in planning your day and ensuring your energy is going towards things that really matter. The Pomodoro Technique is so easy to use. I’ve always known about the Pomodoro Technique but have never actually implemented it into my workday. With the Productivity Planner, the hard part is already done for me. All I have to do is set a timer on my smartphone (I use the command, “OK Google, set timer for 25 minutes”). It reminds me to take breaks and look away from my screen at least twice an hour -- a reminder I often welcome. There isn’t enough room for tasks. I understand that this statement doesn’t fit with the whole point of the Productivity Planner, but I simply need more room for weekly and daily tasks. It doesn’t leave much room for daily recurring tasks, like “write a blog post,” “reply to X email” or “schedule this social media content.” These items might not take up a ton of time, but I do need space for them in my planner. There’s no calendar or monthly pages. I love that the Productivity Planner isn’t dated, but I would love it more if there was a section of undated calendar months that I could fill in myself. 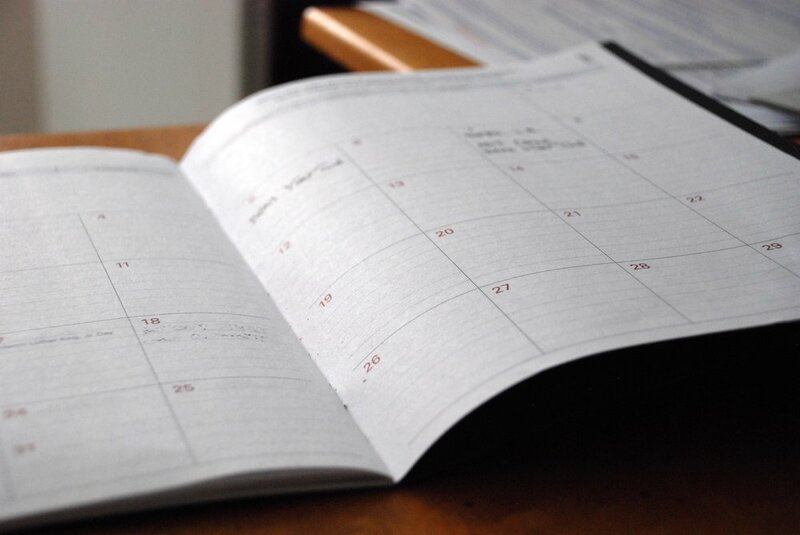 I want a planner where I can keep track of my tasks, schedule, meetings and important dates all in one place. Without these features, I am still fully reliant on my phone’s calendar. This means that I have more that once forgotten about a meeting I had scheduled until my phone notified me 10 minutes prior. The “most important task of the day” isn’t always useful. Many days, I am listing my tasks in a completely random order simply because no one is more important than the other. As a freelancer, I have to prioritize all my clients fairly equally, and I need to ensure I am on track to meet all their deadlines and expectations. While a prioritized task list is great in theory, it doesn’t always work for me (but it does get me thinking about my priorities, which is a win in itself). When I use this planner, I still need other planning tools. As I mentioned above, when I use the Productivity Calendar, I still need access to a notebook where I list my tasks for the week and my digital calendar. This isn’t ideal. I’d love for my notebook to just be a place for notes and ideas, and for my phone to not be a necessity at all times (I put it on silent mode quite regularly). The Productivity Planner is great, if it works for your job and workday. I love the methods it uses and would like to practice prioritizing my day more regularly. However, what I really need is a marriage of the Productivity Planner and a traditional planner with a bigger section for notes. This would ensure that I have a place for tasks and a place to note my schedule, without turning to more than one tool. Have you tried the Productivity Planner? Tell me about your experience and best uses in the comments below!